Teapot with strainer makes tea together ,more convenient to drink. Material:Stainless Steel. Assembly line handle makes you feel comfortable. Also pretty as herb pots for the garden or window sill. Black Rim and white inside. This stainless steel water jug is essential for shaking tea or any liquid that could use a good mixing before drinking. 1 Piece Coffee Tea Pot. - Long Lasting. - Material: Stainless Steel. Features: Transparent color design, you can easily see the inside. The products are made with glass, adopting a low-expanding coefficient technology. 250ML capacity can meet your great need. Strictly tested by QC system, every piece of the products looks perfect and excellent in quality. Teapot with strainer makes tea together ,more convenient to drink. Material:Stainless Steel. Assembly line handle makes you feel comfortable. Large capacity and durable 2. Olive shape cover makes it more fashion. 1 kettle, 1 filter. Stainless steel pour over coffee filter cone dripper with a cool-touch handle, for use only with filtered ground coffee. Item: Pour Over Coffee Maker/Coffee Pots. Your coffee dripper set is dishwasher-safe on air dry only. Capacity: 250ml. 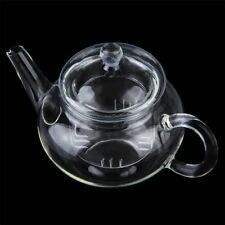 1 x Transparent Teapot. Made of superior glass for good durability. The products are made with glass, adopting a low-expanding coefficient technology. Material: Glass. Transparent color design, you can easily see the inside. Creative Tops Barcelona Teapot. 450ml Retro Blue This stylish and petite Barcelona teapot is from the coffee connoisseurs La CafetiÃ¨re.|A fantastic little design, Barcelona is a 450ml ceramic teapot that is ideal for one person or simply for those who desire an elegant amount of tea|Crafted for contemporary tastes, Barcelona is perfect for every kind of tea lover with its handy removable filter: this makes it suitable for both tea bags and loose leaf tea, from traditional English tea to fruity and herbal teas. |A retro blue stoneware body with stainless steel lid, this trendy model is also available in retro red or pistachio |Capacity: 450ml. . SHABBY CHIC WITH LIGHT CRAZE IN PLACES, V FINE HAIRLINE (APPROX 1/2") TO RIM. OTHERWISE LOVELY OLD POT. ROUGHNESS ND MAYBE A LITTLE NICK ON END OF SPOUT AS I'VE TRIED TO SHOW. CAPACITY APPROX 1 1/2 PINTS. COLOUR - BLUE Peacock (ON THE LEFT). All pieces are made entirely of heat resistant porcelain. Good for hot, iced tea, coffee (bag cofee) brew. It has elegant and modern design. It brings efortless elegance and beauty to your kitchen. Drink Me White Black Script Porcelain Tea Set Mad Hatters Tea Party with tea pot, sugar bowl and milk jug. Condition is New. Dispatched with Royal Mail 2nd Class. Renberg Oslo Stovetop kettles with Filter and in Various Colours 750 ml New. Flood & Security Lights. SECURITY ACCESSORIES. New Arrivals. We will then issue you with a FIT number for reference and that will should be quoted on all future correspondence. Capacity1 Litre. 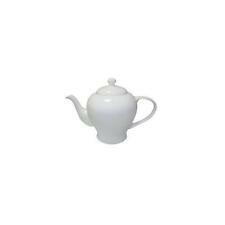 White colour teapot featuring strong but lightweight dolomite ceramic material and classic teapot shape with heart shaped handle. 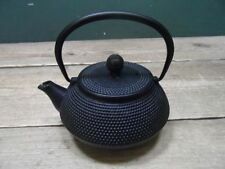 It has attractive "Tea solves everything" design on the front centre with embossed heart and cut-out heart detailing around the top rim by the lid. 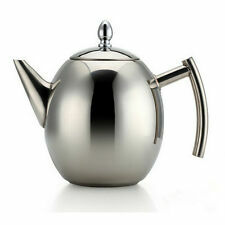 With a stainless steel finish this tea pot is a must for all tea lovers. A great addition to any kitchen. 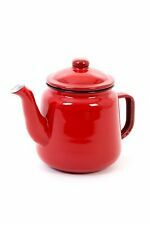 This item is dishwasher safe and due to being made from ceramic the teapot is very sturdy while having that modern stainless steel lid. ★ 450ML CAPACITY, IDEAL FOR TEA LOVERS. Capacity: 450ML. 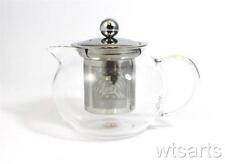 1 Teapot with Stainless Steel Infuser. ★ SPILL-FREE DESIGN – Handcrafted Streamlined kettle outlet mouth for smooth water flowing, and effectively prevent water splashing. 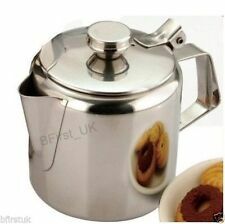 Stainless Steel Teapot Pot. With Removable Infuser Filter 2L BN NEW silver. Condition is New. Removable Stainless Steel Tea Infuser is included making it suitable for tea bags and loose tea. 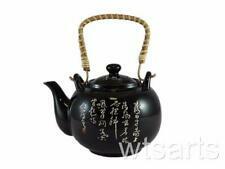 Beautiful look of this teapot makes it a perfect gift for tea and coffee drinkers. Large brightly coloured hand painted teapot with fruit designs around it. Purchased in spain many years ago. Just sat in a cupboard unused. In perfect condition. Thanks for looking.